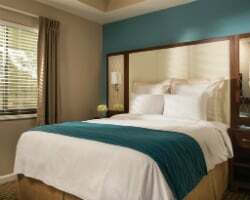 Make your Orlando vacation dreams come true with the upscale timeshare accommodations at Marriott's Royal Palms. Find timeshare resales and rentals priced up to 70% lower than retail costs. 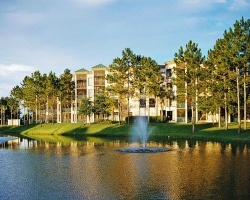 Visit Central Florida in style with the timeshare units at the Marriott Royal Palms resort. This stunning offering from Marriott incorporates effortless luxury with the ultimate convenience to allow you to truly enjoy your Orlando getaway. Use the resort as the perfect home base to explore area attractions like Walt Disney World and Universal Studios, or stay on-site to enjoy the fabulous resort amenities and take in the beauty of the expertly-maintained grounds. Whatever it is you seek to do, the Marriott Royal Palms is the place for you. 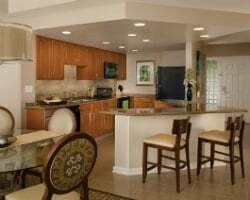 The accommodations at the Royal Palms Orlando consist of wonderfully-appointed two bedroom villas that bring modern furnishings and efficient designs. Perfect for families or other groups, the villas sleep up to six people comfortably and are filled with in-unit amenities that will make you feel right at home. Cook your own meals in your very own full kitchen, soak in the whirlpool-style tub in the bathroom, or enjoy evenings by sitting out on your balcony and relaxing. If you're ready to find a home-away-from-home in the middle of Orlando, you've arrived at the right place. Fill out the form on this page to learn more about the ownership opportunities at the Marriott Royal Palms, or call a representative directly at 1-877-815-4227. Owning a timeshare at a resort like the Royal Palms means you get years of great trips to Orlando packed with exclusive owner benefits. However, buying a timeshare resale at the resort can save you money while still earning you the same great perks of timeshare ownership. Resales are sold by current owners instead of the resort itself. This means that prices are more realistic, offering vacationers like you the deal of a lifetime. You can find high quality timeshare units at the Royal Palms at prices up to 70% lower than retail costs. Timeshare resales at the Royal Palms typically come in the form of deeded fixed and floating weeks. In addition, timeshares fall within Marriott's Blue, White, and Red seasons, offering a variety of price points and ownership intervals to consider. 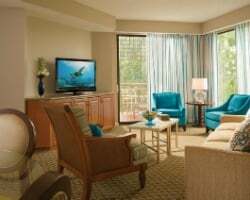 Your timeshare resale at the Royal Palms Orlando could also be your ticket into the Marriott Vacation Club. The Royal Palms resort is affiliated with the Marriott Vacation Club, one of the world's most popular ownership brands. As a timeshare resale buyer, you can take advantage of some club perks and start making reservations at the Royal Palms immediately, but more opportunities to reap the benefits of ownership lie within upgrading your timeshare. Upgrading into the Marriott Vacation Club Destinations program can unlock points-based ownership style to allow for easier reservations. It will also enable you to use your points to explore other vacation possibilities at different Marriott resorts. The Marriott Royal Palms Orlando is affiliated with Interval International, one of the world's leading timeshare exchange companies. Timeshare exchange can help you get the most out of your timeshare resale, as it can enable you to discover different destinations all over the world. With a separate Interval membership, you can deposit your Orlando accommodations and trade for stays at comparable resorts in spots like Las Vegas, Hawaii, or New York. What's more, the Royal Palms is a Premier rated resort, which will likely increase your trading power on the exchange market. The Royal Palms resort features an amazing array of on-site amenities and services to help make your vacation one to remember. Start by hitting the Royal Outdoor Pool to cool down on those hot Orlando afternoons, or take a dip in the hot tub during the evenings. Fitness nuts can stay on top of their exercise goals at the Royal/Imperial Palms Club House fitness center, or by heading down to the tennis or basketball courts. Other services, such as the free parking, enable guests to store a rental car to embark on day trips or visit favorite attractions easily. Speaking of attractions, the Marriott's Royal Palms is within a wonderful proximity to some of the best in Orlando. Families will undoubtedly want to visit Walt Disney World, Universal Studios, and SeaWorld Orlando, while longer day trips can take you to Busch Gardens or the Kennedy Space Center. The Hawk's Landing golf course is under a mile from the resort for guests who favor hitting the links, while the Mall at Millenia is great for shopaholics. Already Own at Marriott’s Royal Palms?